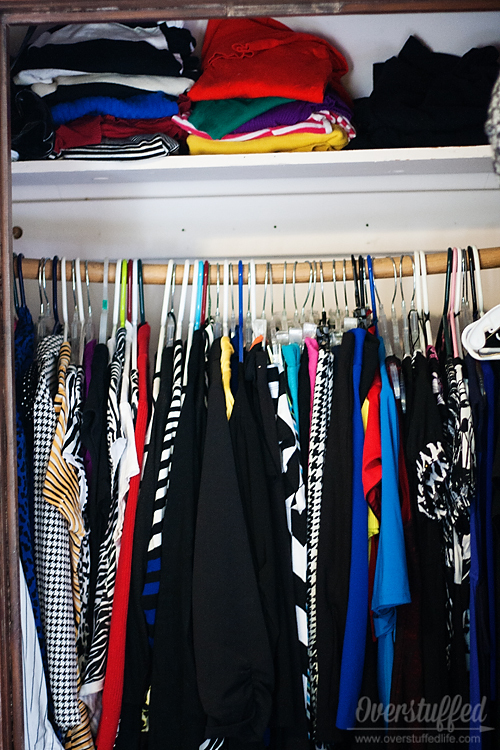 For the next few days, I'm going to show you a few ways I've applied the principles we've already discussed in my own home, starting with my closet. Remember how I said I was a minimalist? Yeah, well, that doesn't really apply to clothes. When it comes to clothes, I am a hoarder. The one thing I have going for me in this area is my 105-year-old house and its teeny tiny closet. The closet in our bedroom is so small, that only Joel's clothes fit in there. My clothes live in the very small closet in the office (which is really a bedroom, we just use it for an office). Yet another space in my office that is always a mess. Le sigh. 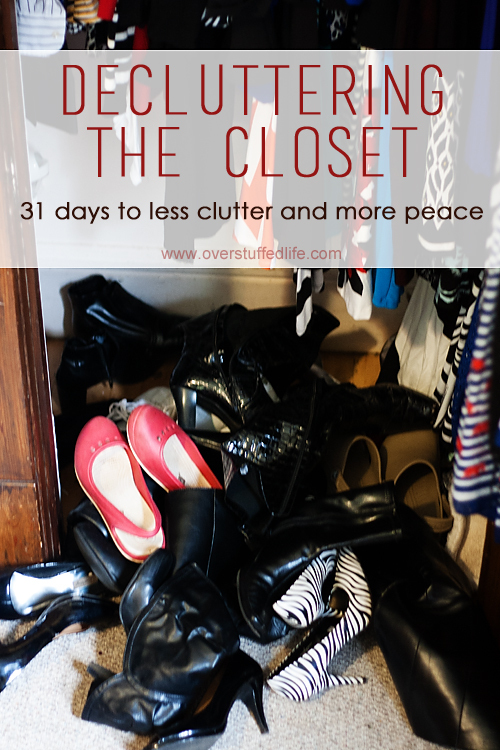 But, since I'm taking my own challenge this month, I tackled the closet. Obviously I have a little big shoe problem. But I also have some totally amazing zebra heels. 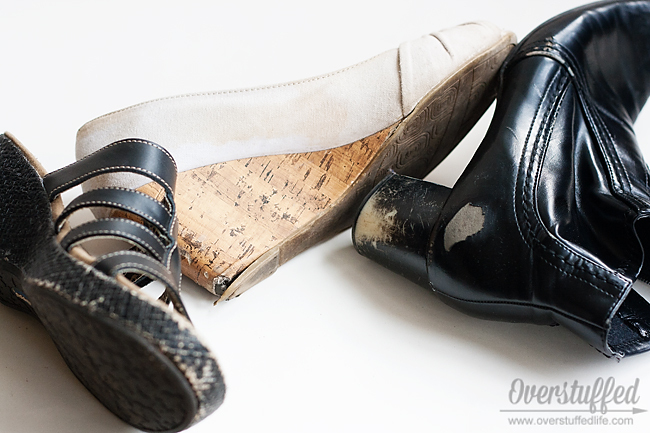 My shoes are usually a mess like this, because I just kick them off at the end of the day. Or I dig through the pile to find the ones I want. And, embarrassingly enough, those aren't even all the shoes I own. There are 4 shelves just inside the closet there that hold another 3 pairs of shoes each. What can I say? I like shoes. But, I have too many, and they were getting in the way of my happiness and peace. I couldn't organize them because there were simply too many for the space that I was allotted. The rest of my closet actually stays fairly organized. 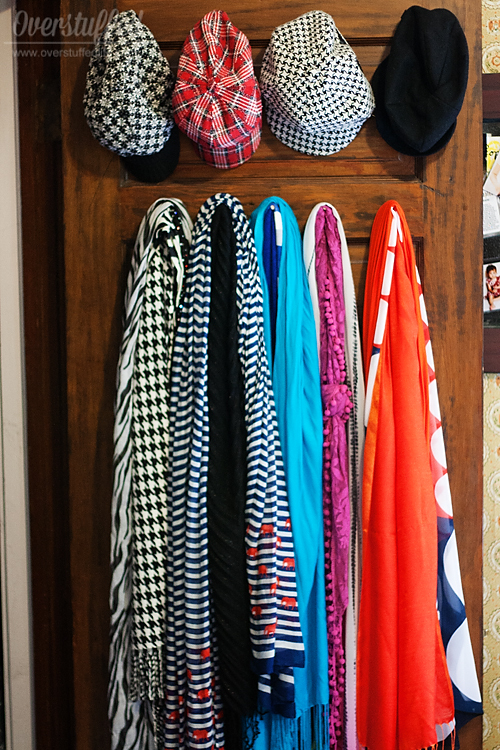 I put hooks inside the door a few years ago to hold my hats and scarves. Yes, I also have a little bit of a scarf problem, but it's not quite so large as my shoe problem! I am somewhat picky about the order my clothes hang in the closet, so they are always quite organized as well. (My closet is so freaking small I couldn't get a good total photo of it!) On the top shelf are purses, sweaters, dress slacks, and another pile of hats. I like hats, okay? From left to right on the bar are long-sleeved blouses, short-sleeved blouses, short-sleeved cardigans, long-sleeved cardigans, blazers, long skirts, short skirts, short dresses, maxi dresses, and gowns. While I'm not good at always immediately hanging up my clothing when I've finished with it (we'll talk about that issue later), when I do hang it up, it is perfectly organized. The only thing I dislike is that I have to keep gowns in my tiny closet. I just don't have anywhere else in the house that can accommodate floor length gowns! I need to do some brainstorming about that problem, but for now, performance gowns take up space in my closet. My first item of business was to get rid of some of the clothing. I actually declutter my clothes on a fairly regular basis, because my space is so small. This time I got rid of two dresses, three blouses, one sweater, three scarves, and three skirts. Not bad. I asked myself the hard questions and was totally honest. One of the skirts I've never really liked because the length is weird on me. The other two I just don't wear for whatever reason. It's been over a year. Same with the blouses and scarves. They just weren't right for me. One of the dresses I got rid of doesn't fit me properly and isn't worth keeping, and the other one I love and adore, but I have just plain worn it out. That one went into the garbage because it has a couple holes and other issues. Nobody is going to want it, no matter how much I loved it. I also threw three bags into the donate pile because I haven't used them in forever. One of them even still had the tag on it, and I've had it for about five years. Not worth it! I'll let someone at the consignment store be delighted to find a brand new bag instead of storing it in my tiny closet for another five years! Incidentally, if getting rid of stuff you paid good money for but never used bothers you, it's time to learn about what sunk funds are. That money is gone whether you keep the purse or give it away, so you might as well just stop letting it have any control over your life and donate it. But then I had to tackle the shoes. I looked at all the shoes and realized that, besides the one pair of boots, there were a couple other pairs of shoes that had seen much better days and should go straight into the garbage. So into the trash they went. But the truth of the matter is, I only really wear three out of the nine pairs on a consistent basis. The others are either too tall, too uncomfortable, a little worn out, or out of style. 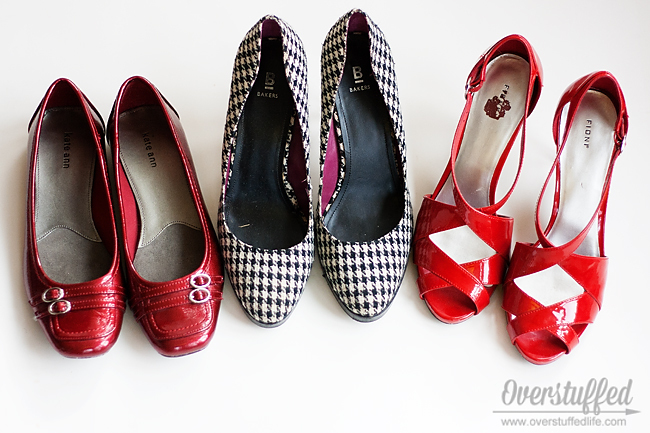 So, I kept the three I wear often, plus my character shoes, and got rid of 5 pair of black heels. And I got rid of three more pairs. You may have noticed that I really like houndstooth. I mean, look in my closet there and you'll find several items. I have a houndstooth coat that I absolutely love. Yeah, so we've now established that I have a shoe, hat, scarf, and HOUNDSTOOTH problem. Do you suppose I need counseling? Anyway, you can imagine how difficult it was for me to put those shoes in the donate pile. But the fact is, they don't fit me right. Whenever I walk in them, I step right out of them half the time. So I don't wear them hardly at all. Instead they just sit in my closet with their houndstooth counterparts and I take them out once every quarter to admire them. But rarely to wear them. The good news is that there will always be other houndstooth shoes, and maybe someday I will find a pair that fits properly. The red pairs were easier to get rid of. I like them, but I haven't worn either pair in a very long time. I do believe the last time I wore the red heels was to dress as Cruella Deville on Halloween in 2009. I just don't love the strappiness of them, so I don't wear them. Again, if I want red shoes (and I do!) there are other pairs to be purchased that I will actually wear. Finally, I found this pair of shoes at the very top of my closet. These are the shoes I wore for singing in my senior recital at college. 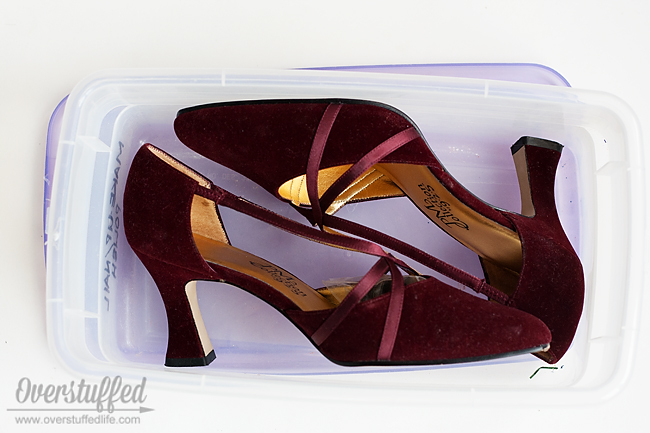 They were in a plastic bin next to another plastic bin that holds the shoes I wore on my wedding day (those I will keep). I'm not exactly sure why I kept them, except that I also kept the gown I wore with them. Frankly, I will never be wearing that gown again because I will never be that thin again. And my feet grew a whole size since having children, so the shoes are too small as well. And also about 16 years out of style. I didn't even feel sentimental about them. I put them right into the donate box without a second thought. And hey! I gained another plastic bin to store things in. A great bonus to decluttering and organizing is finding things you didn't remember you had! I found a cute pair of sandals that I had totally forgotten about. So basically I went the whole summer without wearing them. But that's okay. Now that I've gotten rid of 12 pairs of shoes, I will be able to find them next summer. Also, I found one of my slippers, but not the other one. I have a feeling my dog took it under my bed. I hope. It is starting to get kind of cold around here! Finally, be careful about what you bring back into your closet when you are shopping for clothing. One thing that has helped me a lot is Dressing Your Truth. This system has saved me a lot of time and money and, most of all, SPACE IN MY CLOSET! You can check it out by clicking here: Dressing Your Truth. 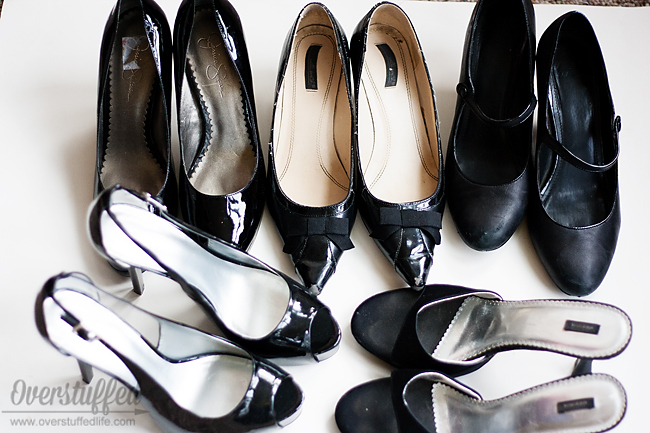 More tips can also be found in my Save Money by Shopping from Your Own Closet post. Now get that closet organized! 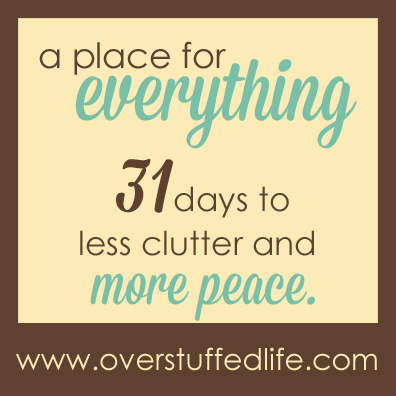 What space(s) have you managed to declutter and organize so far? General Conference is my FAVORITE time of the year to be a blogger! I think I came across something you posted on twitter, now that I think of it... I created a TON of memes this year, it was so much fun! Love your husband's new do, he should keep it =) -- just read the other comment and apparently I'm not the only one who feels that way! You're the best. I miss you. I didn't do any but this one, this year! Maybe I'll get to them--there are always such beautiful quotes I want to remember! I miss you, too! But I am thrilled to my toes that you are blogging more regularly again.